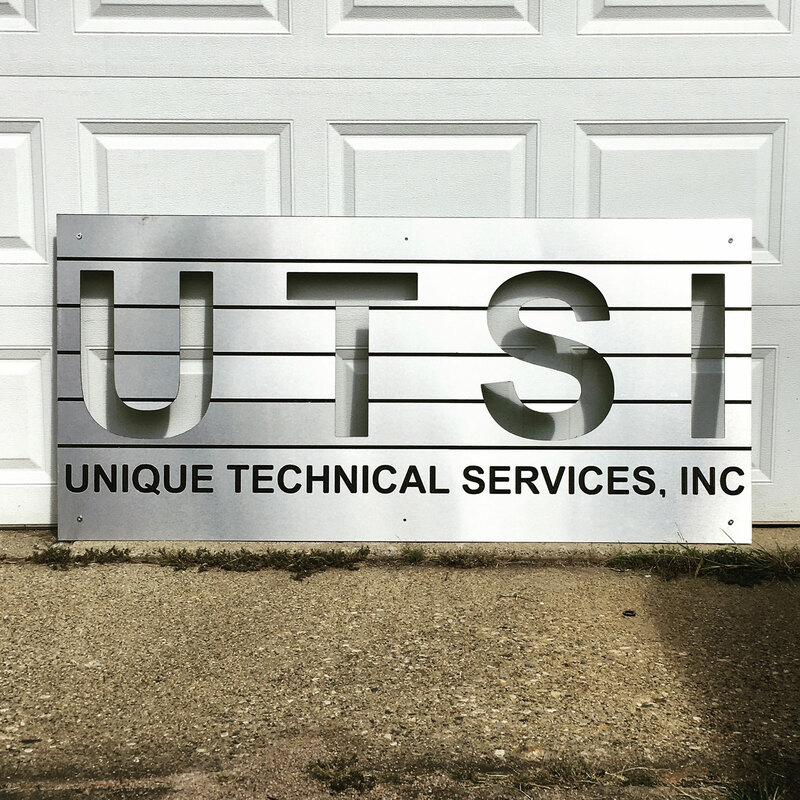 With a corporate sign to fabricate for an energy consulting firm, Unique Technical Services, Inc., Porzondek thought he would begin with .125 inch thick aluminum plate. Instead of painting the milled areas black, like he had intended, he was recommended Dibond aluminum composite material. By utilizing the ACM, he wouldn’t have the added step of painting the cut sides due to the black polyurethane core. 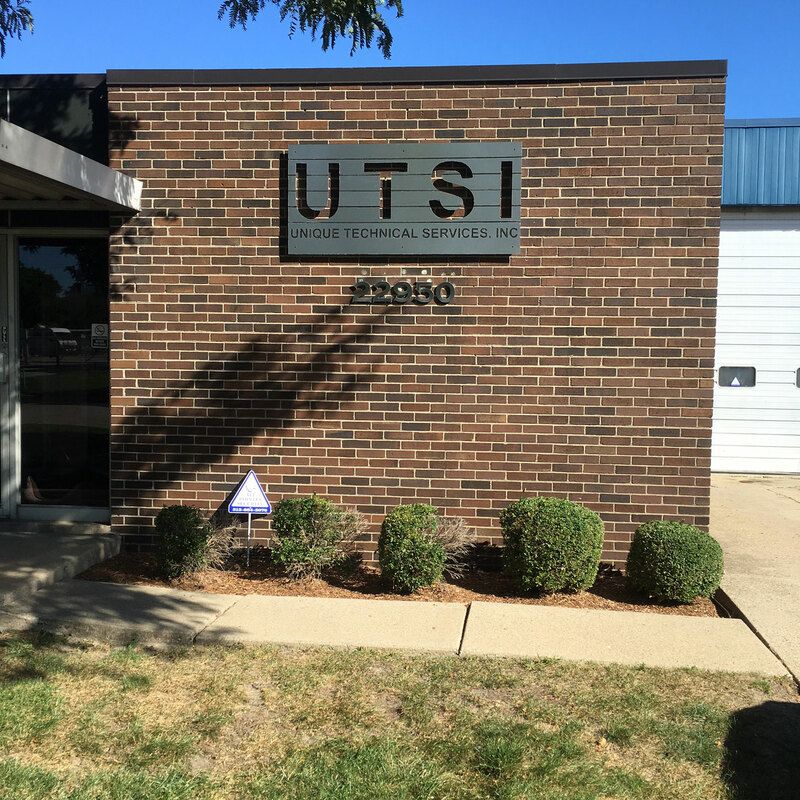 The aluminum signage for the Michigan consulting firm started from a typical 4’ x 8’ sheet of Dibond – sourced from a local plastics supplier. The final size of the sign would span over five feet wide and nearly three feet high. The result would be an understated, yet elegant, silver-industrial sign for a young, local company. Porzondek applied no paint to the surface of the aluminum panel; instead opting to use the material as is. Large block letters in modern typeset featuring the company’s initials were milled into the main area of the sign with smaller type spelling out the full name below. Once the finished signage was put into place at the company’s headquarters, the signage took on a three-dimensional effect with drop cast shadows against a brick facade. Porzondek focused on keeping the panel flat on the CNC table while milling the letters. On the back side of the sign – to keep the sections that were cut out from bowing – and to add some rigidity, aluminum was angled to form a 1.5 inch frame. This frame also served to create distance between the sign and the building.